I am a Druid elder in, “the Order of Bards, Ovates and Druids”, which I have been actively part of for nearly a quarter of a century, frequently in a mentoring and teaching capacity. I also incorporate Buddhist meditation and practices into my life. I live in the beautiful Cotswolds with my partner Fleur. She is a creative artist and facilitator of space, Reiki Master, teacher of breath work, yoga & Yoga Nidra. I am parent to four grown up children; four grandchildren and two step children. I am an experienced celebrant, ritualist & poet weaving a unique magic into weddings, funerals and naming ceremonies. 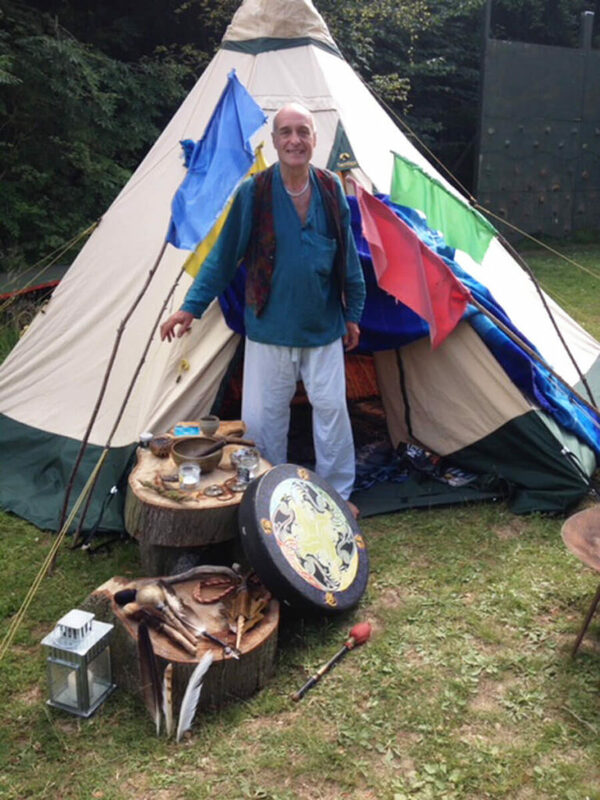 I am often asked to assist in creating a holding/ritual space at ceremonies honouring the eightfold wheel of the year. This is often at sacred sites or at festivals. I have participated, within a spiritual capacity, in various radio programmes, including Radio 4’s ‘Beyond Belief’ and Radio 2’s ‘Good Morning Sunday’. I have produced two CDs and I am currently recording a third – a collection of songs (some of which have developed from poems I have written). These songs have developed into a form of western devotional chanting, which I have called Enchanting The Void. My inspiration for ‘Enchanting the Void’ developed during several years when I lived in a yurt in the woods. During this time, song became integral to my life. I am passionate about Sacred Earth songs, singing the land alive through prayerful vibration. Within my circle I often share teachings and story, along with creating spacious periods of stillness. ‘Enchanting the Void’ is a potent, deeply healing and inspirational space filled with heart resonance: For the land, ourselves and the wider community. Purely for the love of it, I offer a beautifully rich, inspiring experiential workshop on ‘The Awen Power Of Song’. Please contact me if you are interested. I am currently working on a book which will reflect my work and teachings, through song lines. 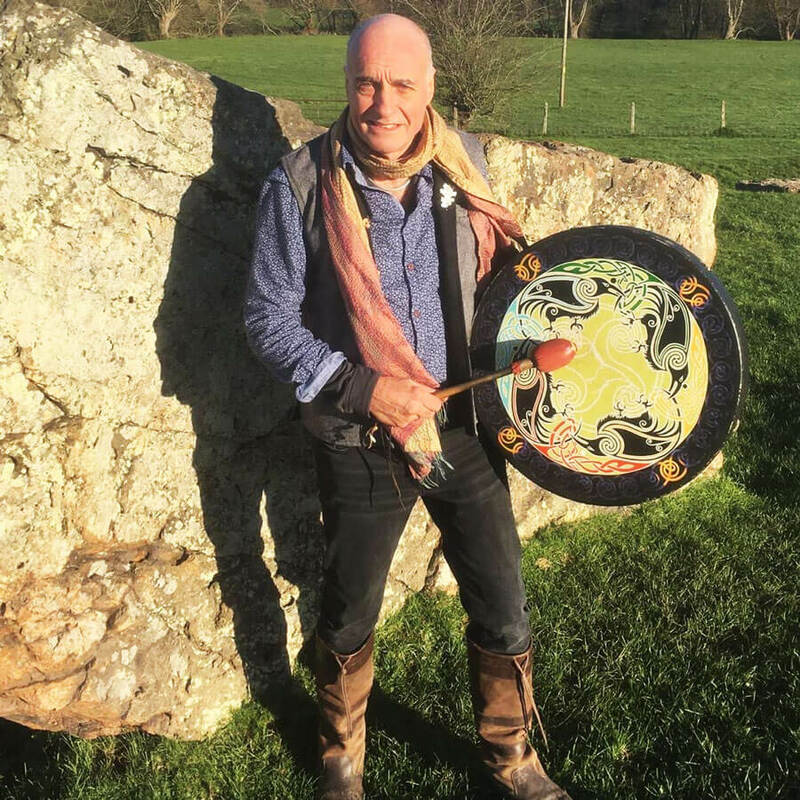 As well as frequent sessions in my home town of Stroud, I travel with this inspired gift of sacred song and silence to various venues in Europe – including Holland, Italy and Germany along with various camps and festivals in the UK and abroad. With many years of experience, creating and co-creating ritual and celebrancy, I have a deep understanding of what goes into preparing and developing a beautiful ceremony, much of which often goes far beyond what is seen ‘on the day’ , and its true worth can often be underestimated. What might you pay yourself if you were offering the work? These questions allow for flexibility in terms of energy exchange. I consider the following guide prices to be a fair starting point, based on the above questions. Day rate and workshop rates by negotiation. Where appropriate, travel and accommodation expenses need to be allowed for.